Friends of Camp Edwards call it their second home. We call them our family. From moments spent huddled around a campfire to taking a leap of faith on our ropes course, Camp Edwards is home to countless memories of campers that have spent time with us over the last 90 years. Enjoying the fun and excitement of camp is an experience the Y wants to make summer camp possible for all children that want to come. That’s why we’re asking you to help make that possible. When you donate, you make cheerful summer memories. You make adventures at Jenks Lake and new friendships happen for kids that wouldn’t have the chance others. When you give to Camp Edwards you teach children to be stewards of the earth, and you give children of all ages and backgrounds values and skills that will strengthen their characters. Give today for a better us. Olivia has always had a heart for adventure. Eager to spend her time outside, Olivia dreamt of summer days spent in the mountains, surrounded by friends. Through the generosity of our donors, the Y was able to make Olivia’s summer camp dreams a reality. 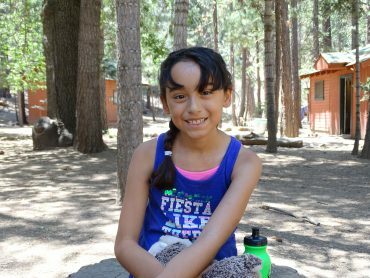 She headed up to Camp Edwards and enjoyed a full week of archery, zip lining, rocking climbing, and evenings spent around a campfire with friends. These new friendships forged alongside the campfire would not have been possible had it not been for our donors. When you contribute to our Kids-To-Camp campaign, you make an unforgettable summer possible for children in your community.